Microsoft on Thursday launched its new Operating System (OS), the much awaited Windows 8, in the national capital, about three and a half hours before its launch in the US. The new OS which aims to be fast, fluid and fun is a mishmash of multitasking capabilities with a crisp and intuitive user interface and clusters of groups of applications — which can all be accessed simultaneously. Old Windows users, who have at least a Windows XP or a Windows 7 PC, can also upgrade to Windows 8. Those who bought a PC June 2 onwards this year (and till January 31 next year) can upgrade from Windows 7 to Windows 8 for just Rs. 699. Others can update their OS via an electronic software download which will cost Rs. 1,999. The company will provide technical support for Windows 7 till January 14, 2020. “Technology has enabled us to be able to use and carry multiple devices. But we at Microsoft wanted to build a platform through which a single device can be used for creation and consumption,” said Bhaskar Pramanik, Chairman, Microsoft India, as he introduced the company’s new operating system. In a changing world, where the line between work and life blur and each one uses multiple devices, Windows 8 aims to integrate all those device functions into one. Windows 8 has managed that to some extent. 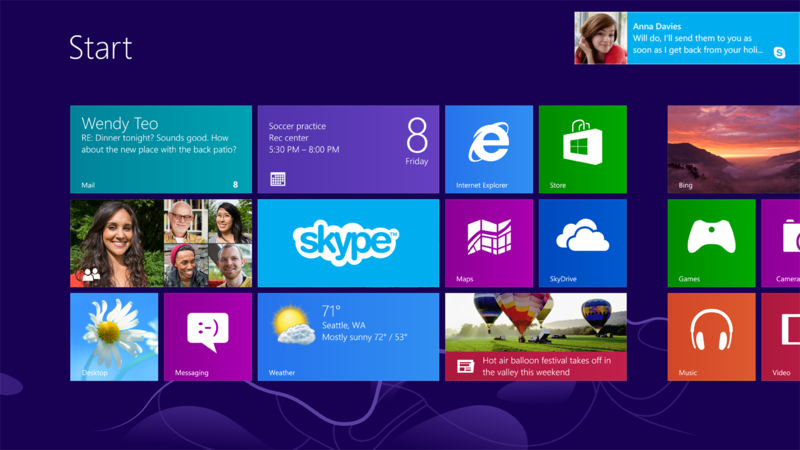 At first look, Windows 8 looks rich, clean and invitingly playful. Its interface is a cluster of applications in use, all split into little rectangular tiles. Each tile can be dragged around and its positioning changed, as can each cluster of many tiles. Each cluster can also be customised to one’s tastes — by adding or subtracting individual tiles in the cluster. The interesting part about the tiles is that they are live – which means, every application is constantly updating in the background even if it is not being actively used. “The best part about the tiles is that it is live,” said Roshan Abbas, TV host and self confessed gadget freak who has been using the OS for a month now. “This helps you save time on loading each app individually and makes things more efficient. I’m definitely not missing the hourglass” he said. Microsoft has done away with its start button for the home screen of Windows 8. 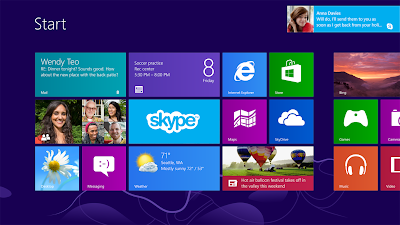 Instead, users have access to the start menu at their fingertips as soon as they log in. Many new Windows 8 enabled devices come touch enabled, with all the trimmings of pinch zoom and easy swipe access. All Windows 8 devices will also come with the Windows App store which sees around 700 apps added to it each day. Among the apps for the Indian consumer are popular apps like PVR, Dhingana, MakeMyTrip, Burpp, and BookMyShow, among others. Another cute feature of the OS is the picture password. As in an Android phone where one can have a design based password, Windows 8 allows the user to have a picture password – which when touched in a certain way will allow the user access. According to its developers, Microsoft, the OS aims to be “everything at once” — a platform that bridges the gap between laptops, personal computers and tablets. It wants to be a platform for consumption and creation, a marriage between a primary device and a companion device and connected anywhere and everywhere – through the Cloud. The company in partnership with its vendors, starting Friday, will launch 250 Windows 8 devices, in India alone. These devices will be available in over 2,500 stores in more than 100 cities. These devices too will be “functional yet beautiful, thin and light weight, connected to the Cloud and grounded in its basics of being accessible through a mouse and a keyboard aside from the touch interface,” according to Pramanik. Some of the vendors which will have Windows 8 enabled OS devices are Sony, Toshiba, HP, Dell, Asus, Wipro, Acer, Samsung, Lenovo and HCL. “At Sony we believe that the next big revolution in the technological world is the holistic convergence of innovation, synergy and connectivity, packed in a single device. An upgradation to Windows 8 offers not only this, but portability speed and ease in utilisation of various processes in a single device,” Kenichiro Hibi, Managing Director, Sony India said. Sameer Garde, President and MD, Dell India, said he hoped this advancement will help bring a paradigm shift in user interface with technology. “Microsoft Windows 8 will help in accelerating the technology development in the IT space. We are glad to be part of a new revolution which will change how people perceive and interact with technology,” he said. “We want to create a desire for the OS and an awareness of the product and how it works. We want to give the end user a good experience and make sure they they feel like they have made a satisfactory purchase,” Amrish Goyal, Director, Windows Business Group, Microsoft India said at the launch. The company was mum on its Surface tablet, which in its first phase of launch releases in eight countries worldwide. Microsoft officials said India was not among those countries. And, for all those people missing their old Windows interface and homescreen, just a click of the Windows key on the new Windows 8 enabled devices, will transport one back to the old interface – keeping with its approach to being ‘Everything at once’. Good move by Microsoft. Not sure if it is a gimmick as well to boost the sales and then start pulling strings on users.